These seven journals of Woolf (1882-1943), begun when she was almost 15 and spanning 12 years, cover her life at home as well as trips to various parts of Great Britain and to Greece and Italy. As Leaska (Communication Arts/N.Y.U.) says in his excellent introduction, these were "private books, written quickly, spontaneously," and they show an apprentice learning her craft. The journal for 1897, "the first really lived year of my life," as Woolf says, would be of little interest were the author not Virginia Woolf. The brief entries are mostly mundane: "After luncheon Nessa went back to her drawings; Stella to the work house, and Father to Wimbledon." But they do reveal her absolute compulsion to put down her thoughts and experiences in writing: "What shall I write tomorrow?" Beginning with the Warboys 1899 journal, as Leaska says, "she was practising the art of essay writing for the first time," and from then on the daily entries are interspersed with short essays. Clear indications of her later skill become evident: Some relatives "move awkwardly, & as though they resented the conventionalities of modern life at every step. They all bring with them the atmosphere of the lecture room." Her career as a fiction writer is clearly indicated by: the 1905 Cornwall entries that recall her childhood, and whose details she would reimagine in To the Lighthouse; an especially moving passage in 1903 speculating on a note left by an unknown drowned woman; and her reflections in the 1906 Greece diary on Prosper MerimÇe's letters to an unknown woman. These later entries plainly reveal Woolf's strengths: accurate vivid details that bring people and places to life; compassion; and truth-telling, even when painful. Although these notebooks do not record the turbulence of her life at this time--her father's death, her own spells of depression--the reader may often infer her state of mind by the calmness or agitation of her entries. The volume also contains full footnotes and useful, interesting appendices. 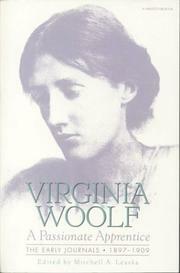 Necessary for Woolf scholars and fascinating for even casual readers.